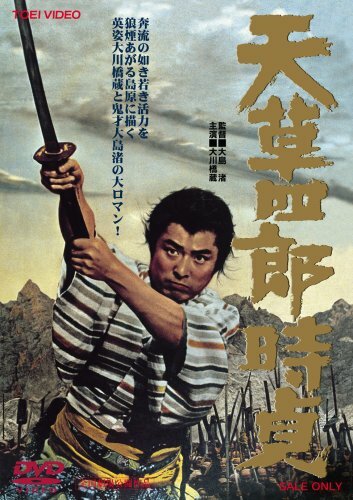 天草四郎時貞 Amakusa Shiro Tokisada (Shiro Amakusa, the Christian rebel) is one of the least Nagisaoshimaesque Nagisa Ôshima’s films. The story’s background is early 17th century’s Kyushu and not the 1960’s streets of a developing Tokyo. The characters represent Christianized peasants and not the sexualized youth of the modern times. But there is one thing in common: the violence, in this case present in the subjugation of farmers by the Tokugawa shogunate and the brutal repression of the recently proselytized Japanese of the South -Francis Xavier had arrived in Kagoshima in 1549 and left the legacy of the monotheistic religion that was gaining adepts little by little. Samurai Shiro Amakusa and his peasants rise up after seeing how their friends are burnt in hay coats (干草の踊り, “the hay dance”), and try desperately to take the castle as a revenge in the name of Jesus Christ. Ôshima’s extreme close-ups and never-ending travelling shots are already in this film, showing strong emotions in the often hieratic Japanese faces. He takes sides for the Christians but also dramatizes their internal discord and their different personal and conflicting motivations, as in a Shakespearian tragedy. An Apocalyptic piece of art, like character Uemonsaku’s paintings of burning buildings and people dying in crosses.